As usual, breakfast plus internet equals us scraping out right around the 10am check-out time, and getting a later start than intended. We knew we had around 100km of dirt today, plus two border crossings, and didn’t think we’d be able to make it far past Rio Grande, but I was secretly hoping to get there early enough to push on to Ushuaia and try to make it all the way. So I was slightly disappointed by the late start, but still secretly optimistic. I didn’t share these thoughts with Kay. When we left the hotel, the sky that we could see from the courtyard was blue and sunny. We were hopeful that we wouldn’t be riding in rain today – I was particularly hoping for that on the dirt stretch in Chile. But because the sky seemed beautiful, and I’d read that the forecast didn’t have any rain in it for today, I didn’t bother to wear the plastic bags under my formerly-waterproof boots. Heading south from Rio Gallegos, we encountered a police checkpoint where they were stopping every person traveling north or south, and writing stuff down on a clip board. 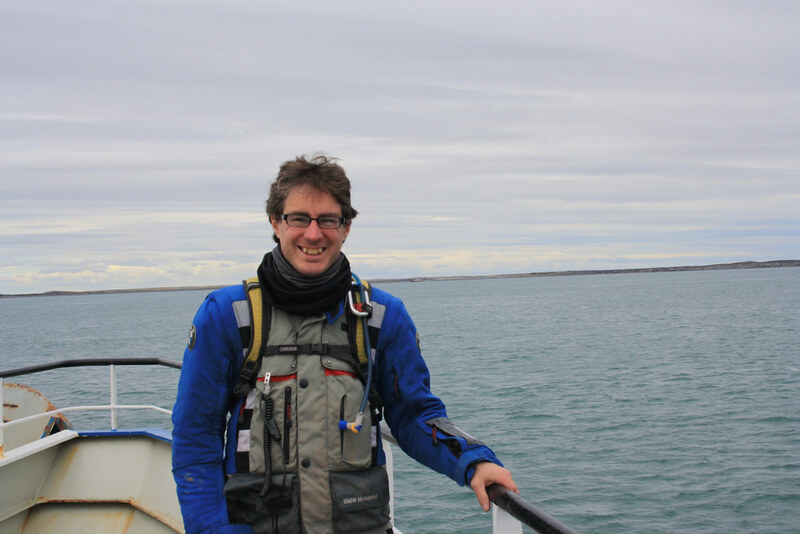 We thought this was a bit ridiculous, because south of Rio Gallegos, where are you going to go? Chile, and then to Argentina again. There’s very little down there. When she got to us, she motioned us to the building on the side of the road, and told us we had to take our passports inside. We did, and they had a giant ledger of hand-written information including passport numbers, names, nationalities, etc. What’s the purpose of this? It’s not at a border. 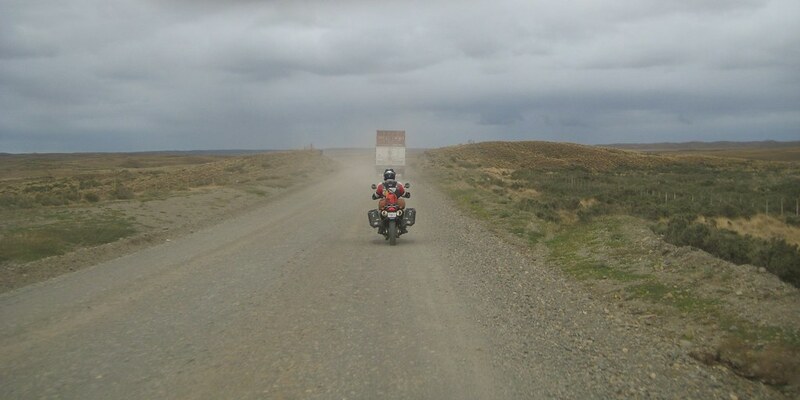 It’s just a random police checkpoint between Rio Gallegos and the Chilean border. Even if they had to retrieve information, how long would it take to find a single entry in a paper ledger this big? We didn’t understand at all, and it was more removing the gear and gearing up again, which is annoying with all the winter layers. Back to the bikes and we pushed on toward the first border crossing, me wishing to go faster to try to beat the rain to the dirt part. We figured we’d have a short-ish day since we were stopping at Rio Grande (I still hadn’t shared my thoughts about trying to push on) so we were taking it a bit easy on speeds. Still, it wasn’t long before we got to the first border – to go into the small stretch of Chile before coming back into Argentina for the final stretch. 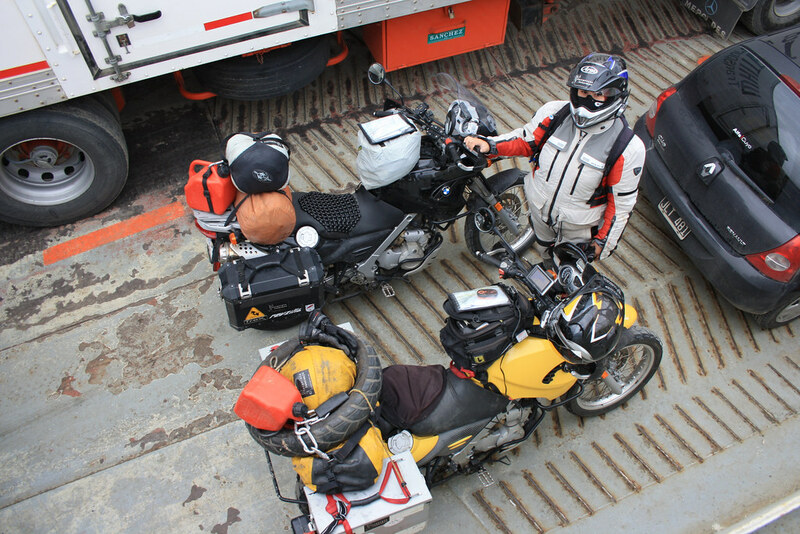 The border crossing was trivial, although it was more like the borders we’d gotten used to up north – check out of Argentina on the Argentina side, ride down the road just a bit and then check into Chile on the Chile side. This is the first non-integrated border post we’ve seen in a while, and we’d gotten kind of used to the one-building borders; this was a bit more of a PITA because of all the extra layers. It takes me forever to gear up with all the layers, and I hate taking my helmet off when we stop because my Foggy inevitably gets messed up, and I have to spend a few minutes fiddling with it trying to get it back in the right position when I put the helmet back on, and then it takes forever to put my gloves on under my jacket sleeves (they’re too long to wear the gloves over them), zip up properly, plug in the electrics, etc. So I had been hoping for the single-building crossing so I could do the gearing up just once… but alas. On to Chile for check-in. They have us fill out one of the forms we’ve already filled out when we crossed into Chile the first time, and Kay tries saying “we’ve already done this – do we have to do it again?” But we do, because the form becomes our bike import paperwork for this teeny stretch of Chile. So we get checked in, and while the border crossing itself was trivial, it took 45-60 minutes between the two buildings, waiting in line, etc. Bah. The day is wearing away. We ride on in the paved section of Chile, and I get occasional rain spatters on my visor. It’s going to open up and full out rain on us; it’s only a matter of time. 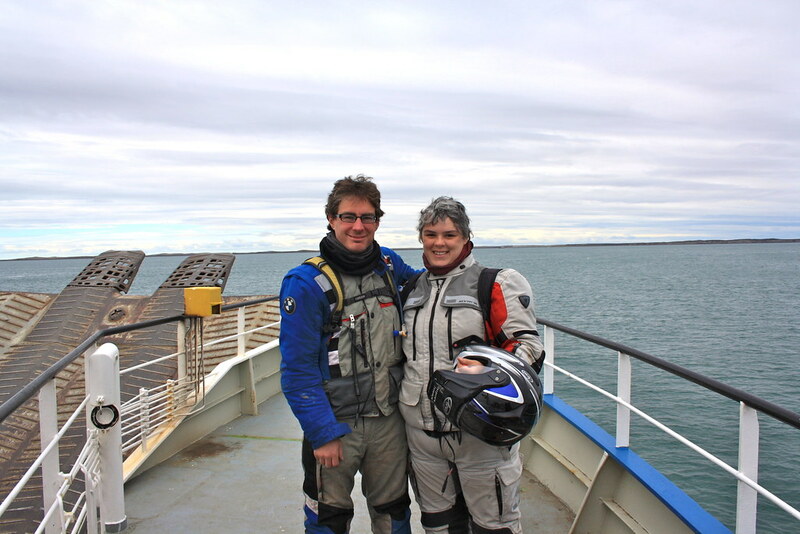 We don’t go as fast as we could, but eventually we arrive at a ferry crossing. Kay had read about a building where adventure riders put up their stickers, and went to go put one of ours on the window and take a picture. He placed the sticker and went to turn on his camera… but discovered that the battery had just died. Bummer. We have a spare charged battery in my pannier, so he walks back to the bikes to get the spare battery, but I’ve already started walking to the front of the line to check on the ferry, and I’m too far from the bike to bring him my camera instead. So he’s got to walk back down the line to our bikes to get the spare battery, and in the meantime, I’ve arrived at the front of the line and see that the ferry is lined up. I suspect they’re going to start waving people on any minute, and doubt Kay has time to get the spare battery. I say over the headset that the ferry is lined up and I think they’ll start boarding in a minute, and assume Kay will realize he should grab my camera and *run* to get a picture of our sticker, but he doesn’t make that connection. He gets the spare battery out and starts to walk up toward the building again to grab a photo of our sticker, but the line has started to board. So he has to run back to the bikes to ride onto the ferry, and we don’t get a picture of our sticker at all. Luckily, I remember we’ll have to come back this way anyway, so he can get a picture of our sticker on the hostel on the way back. Kay’s note: the ferry seemed to have been dallying for a few minutes anyway. I didn’t think that everything would suddenly start happening right away. On the ferry, and the bikes are penned in by cars and a giant semi next to us. I’ve never been on a ferry big enough to transport semis, and there are several on the ferry – I thought there was no way they could fit the entire line of cars and semis on here, but it appears that they have. Kay’s instructed to go pay at the cashier on the boat, but he doesn’t want our money, and we’re still not sure if it’s because we’re adventure riders or they just don’t charge for motos. Kay then goes up to the pedestrian deck to get some photos, and a few minutes later, I decide to join him. We’re up watching the other shore getting closer, and I think I should probably go back down and gear up again since it takes me forever. So I start back that way when Kay says “Dachary! Look what that man is wearing!” “Ohhh, moto pants…” We walk over and start chatting, and Kay meets Liam; a Brit who started this journey in Las Angeles and is also heading to Ushuaia. He and his wife are riding two-up, but his wife has gotten quite cold (they don’t have electrics) so she’s trying to warm up somewhere. We chat for a few minutes, and then his wife Toni joins him, but I’ve already headed down to gear up so I don’t get to meet her. Just in time with the gearing up, though, as they lower the ferry ramp and start disembarking. As semis are driving off, the ferry is still drifting, and I think it’s a bit unnerving that the ramp is moving along the concrete as people are driving off. Kay says “I think we should do that last bit as quickly as possible!” and I agree, but before it’s our turn to ride off, the ferry stops drifting and we get to ride off a stationary ramp onto stationary concrete. Yay! I manage to extract myself from the ferry with zero trouble and am proud of myself for not embarrassing myself by dropping my bike at any point along the way. We have around 60km of pavement to ride before we hit the dirt, and there’s what might be a town at the edge of the dirt. I ask Kay if we should stop for lunch, or just hit the dirt and try to beat the rain. He still doesn’t think it’s going to rain, but I comment that I keep getting spatters on my visor, so he takes my word for it and agrees that we should probably skip lunch and try to get the dirt out of the way before the rain. We get to where the pavement ends, and just before the restaurant at the edge of the rain, we see an adventure rider and wave… and it’s Joe! Joe who we met in Colombia and rode with into Ecuador! I look further and there’s Vern pulling out of the restaurant parking lot, and we’ve all pulled over at the side of the road and start chatting. Vern suggests that we go to the restaurant and grab a Coke and catch up, and Kay and I gladly abandon our plans to skip lunch as we sit down with the guys. I was totally not expecting to see Joe and Vern again on the trip. They ride faster than us, and they don’t take the breaks that we take, and as far as I know they didn’t have any of the bike problems we had that delayed us through Peru and Chile, so I’d expected them to be long gone. But here they are! And I am unexpectedly thrilled to see them. I had definitely enjoyed hanging out with them before, but there’s something really awesome about seeing them here again near the end of our journey. It totally made my day. So we went to the restaurant, where we discover that yesterday morning, Joe’s bike (and himself) had caught on fire. Yikes! Everything seems to be ok, but his Frog Tog top half went up like kindling, and he’s got burned patches on his motorcycle jacket and his frog tog pants. His bike also has some burn spots. What happened, you ask? I’ll let Kay write it because he got more of the details. I’m just glad Joe’s ok, and his bike is good enough to continue the journey. Vern also did a full writeup on his blog, if you want some pictures and the story from the guy who witnessed it all (and got Joe stopped so he could put the fire out – apparently Joe couldn’t see the fire at all, and didn’t realize that he and his bike were on fire – and wouldn’t have if Vern hadn’t gotten him stopped). 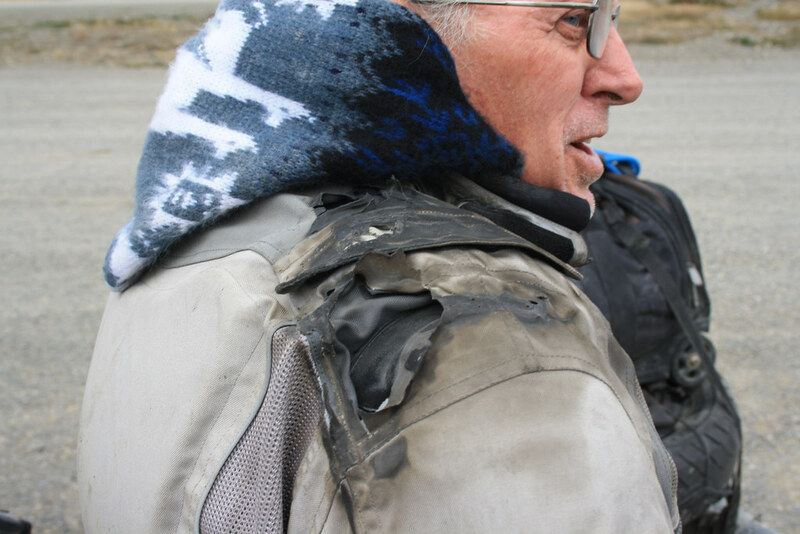 Kay’s note: Joe had a gas can on his pannier, which had a towel under it to keep it from rattling. The edge of the towel was apparently touching the muffler, which set it aflame. Then, the flames licked upwards towards the tire he was carrying and the quarts of oil he was carrying IN the tire. The plastic oil jugs melted and oil poured down onto the muffler which was wrapped with some fiberglass webbing (don’t know why) which acted like a giant wick when combined with the oil. Dramatic story aside, it was really great to see the guys again and catch up with them. I really enjoyed riding with them and it was wonderful to see them so close to the end of our journey. During lunch, the Brits arrived and joined peripherally in the conversation – I would have been happy to chat with them more, too, and hope they didn’t feel excluded – I was just having such a good time catching up with Joe and Vern that I didn’t have a ton of attention to spare. They recommended a place to stay in Rio Grande and promised that they’d send us details on a place to stay in Ushuaia. And they gave us some info about the dirt stretch we’d have to travel – Joe initially called it “damn near like an Interstate” but they amended the statement to say that there were some sections with loose stuff, and to watch out for the corners because some loose stuff has gotten piled up in them and it would be easy to take a tumble there. But in all it was a good dirt road; Joe said he’d been going around 35ish MPH, and Vern 40-45 MPH. Buoyed by our surprise visit from what felt like old friends at this point, I didn’t even have it in me to dread the dirt. I was in too good of a mood from our surprise encounter with the guys. We went to the nearby town to get gas, and then Joe and Vern headed north and we hit the dirt. It was pretty much exactly as they’d said. The starting bit was wide and a bit rocky but there wasn’t much loose stuff, and it was easy to go fast on. Kay had me lead so we could go at a speed where I’d be comfortable. Whenever we got close to corners, I slowed down a bit with Joe and Vern’s warnings in mind, but we didn’t have any trouble. Toward the middle of the route, we encountered a longish stretch of loose stuff, but it was a relatively thin layer of loose stuff and nothing like the horrors of Routa 40. I found myself driving 30-45 MPH most of the way, and we made good time. I even passed a couple of cars and a semi or two. I think Kay was probably surprised by my speed. Toward the end of the dirt, the rain caught up with us. It was a light drizzle a first, and didn’t seem too bad; it mostly was keeping the dust down. Nothing seemed to get particularly slippery. 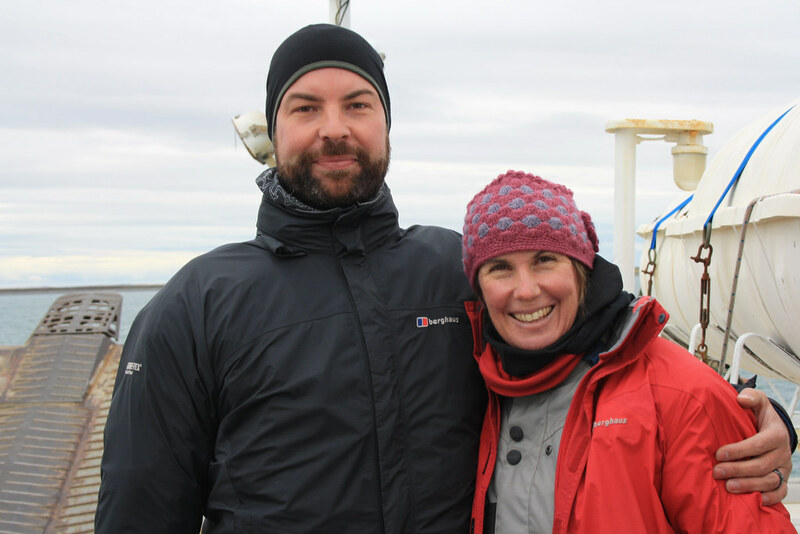 We arrived at the first border crossing to exit Chile and encountered the Brits. They were just leaving. 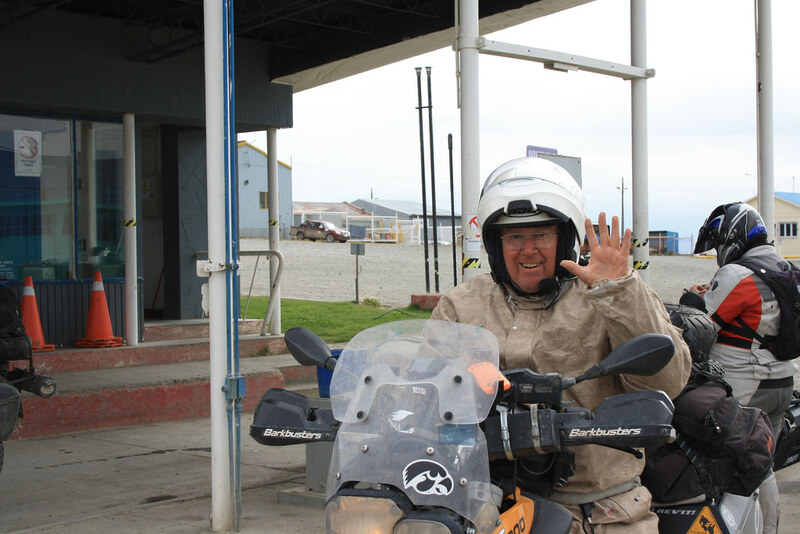 Liam said it was a quick stop, so I left my helmet on to minimize the re-gearing-up between this border post and the next one. Vern had warned me there was something like another 8 miles of dirt before the next border post, so I knew it would take a bit, and then it turned to pavement again. Unfortunately, checking out of Chile wasn’t as quick as Liam would have us to believe. Mostly because it seemed like every person in front of us had some kind of trouble that require five times longer than it should have to process them out. While we were waiting in line behind like five people, and entire busload of passengers disembarked, got processed through the border, and then left again. In the time it took to process an entire busload of people, two of the people ahead of us got through. Eventually, the guy who processed the bus waved us over and processed us out of Chile, and only one guy was ahead of us at customs, so it didn’t take long there… but what I had expected to be a five minute stop had taken like 25 minutes. Kay’s note: on the Chilean paperwork, where it asks for the number of passengers for the bike the correct answer is the number of passengers it IS carrying not the number of passengers in COULD carry. This is the opposite of all the other borders that ask that question. This caused a minor delay in processing my bike out. Down the remainder of the dirt, and to the border crossing where we check into Argentina. Which, again, sadly, was quite slow. Again, only a few people ahead of us, but there was only one person working and I think it was the same few people who had problems checking out of Chile. So it took *forever*. It took us something like 45 minutes to process into Argentina, and the actual processing itself only took like 10 minutes. Now don’t get me wrong – this is nothing for the border crossings in Central America. Our longest border crossing was the Pan Americana in Honduras and that took us over 10 hours, and we’ve heard horror stories of people waiting for days. But down here, the borders have been quite efficient. And for this teeny stretch of Chile, we were expecting the borders to be trivial – which they were – but they took far longer than we would ever have guessed they would. 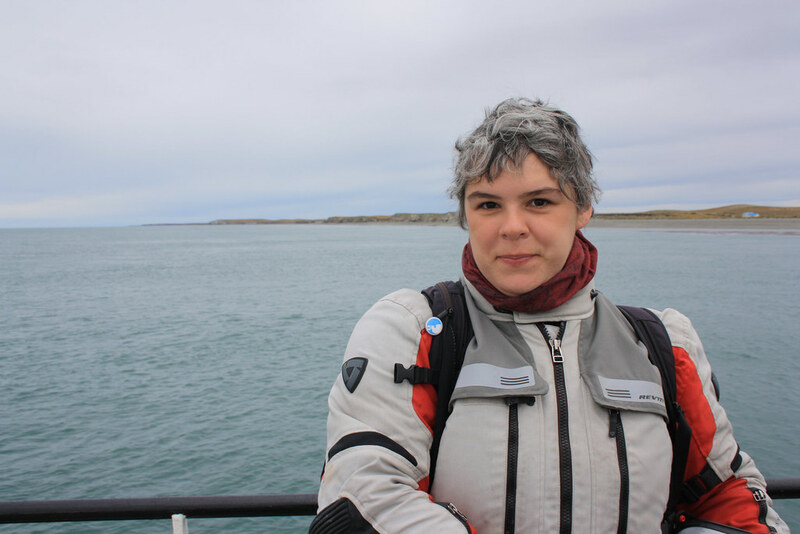 Kay’s note: there’s literally nothing in this tiny part of Chile besides a penguin beach and an elephant seal beach (i think), and a tiny handful of dirt roads, so there’s not a lot of point in doing much more than waving people through. So by the time we got processed through Argentina and back on the road, it was getting close to 5:30PM. And it was raining. Rio Grande was something like 100km away, and Ushuaia was still close to 300; there was no way we could make Ushuaia before dark. So Rio Grande it would be. And it wouldn’t even be the early night we’d been expecting. The ride to Rio Grande was relatively uneventful. We were reunited with the coast, and it was quite windy at points, but otherwise it was blessedly boring to be back on pavement, even if there was rain. When we got into Rio Grande, we followed Joe’s directions to the gas station, but headed first to the hotel across the street that he had recommended. Unfortunately, the hotel had no vacancies. Kay asked for a recommendation and got directions to another hotel, but we decided to get gas first as we were here and they seemed to have gas, and we had no idea if they’d still have gas in the morning. So we got gas, and then rode off to the hotel that the first place had recommended. They also had no vacancies, and recommended a hotel back the way we’d come, but neither Kay nor I had seen it. So we rode off looking for the third recommendation, and didn’t see it, but I spotted a hotel down a side street. In this maze of one-way streets, it took us a bit to get to the hotel, and I got horribly disoriented at one spot and was sure we were headed the wrong way, but we found it and Kay went in to check. They did have a vacancy, but it was outrageously expensive and they only had street parking. We’d take it, anyway; we were worried about getting a hotel at all and had no idea where to look for another. And we’d been warned that everything was outrageously expensive, so it didn’t really matter… we just needed a warm, dry place out of the rain. We unloaded the bikes, and then, because we were parked on the street… for the very first time in the 15,000+ miles on this trip, we pulled out our motorcycle covers and covered the bikes. That saved us the trouble of bringing *all* of our stuff in and made us feel a little more secure with the bikes parked on the street. Kay’s note: I’d totally forgotten about the covers. Didn’t even occur to me to use them, but so glad we had them when she reminded me. We ventured back out again pretty quickly, without changing out of our wet gear, because it was still raining a bit and I didn’t want to get my dry clothes wet. Armed with a map Kay had gotten at reception, we headed toward the restaurant the woman at the desk had recommended. It was after 8PM so we were fairly confident the restaurant would be open. We found it without too much trouble, walked up and tugged on the door handle… nothing. It wouldn’t budge. Lights were on inside, and I saw wait staff wandering around, but it wasn’t open yet. I assumed they would be open soon, and we just had to kill some time. Luckily, I’d spotted a confetteria, which I correctly surmised would have tasty things, so we walked back to where I’d seen it and grabbed some delicious-looking baked goods. And then we walked back toward the supermarket we’d seen so I could look for some Diet Coke that I could take back to the room, but we passed a kiosk along the way that had some, so we just grabbed it there. At this point, it was after 8:30 so we headed back to the restaurant. A couple was sitting at a table by the window, so we were optimistic… but when we tugged on the door, it was still locked. Still not open. This time, though, a guy came to the door and opened it… and when we asked if the restaurant was open, he sprouted a stream of rapid-fire Spanish at us. Neither of us was catching what he was saying, so Kay tried again to simplify it. “I don’t understand. I speak very little Spanish. Is the restaurant open, yes or no?” (In Spanish.) Again the rapid-fire stream of Spanish, but we got the impression that the restaurant was *not* open, and I caught a “medi-hour” in there somewhere. So we thanked him and walked away. …and ran into the Brits again! They were coming to the restaurant where we’d been trying to eat – the one that wasn’t open. We told them about our experience there, and that we were looking for someplace else that was open, hoping they’d join us. We always like chatting with other bikers and were hoping to have dinner with them somewhere, since they hadn’t ended up at our hotel and we had no idea if/when we’d see them again. But they were set on trying the restaurant that wasn’t open yet, and I wanted food, so we went our separate ways. Further than we thought, and the restaurants were both restaurants in hotels. One looked super fancy and had a casino in the hotel… I didn’t want to eat there. So we tried the one across the street. By the time the menu came, I was crashed to the point of not having it in me to decipher the Spanish and make a decision about food, so I asked Kay to order me a chicken dish. He got me chicken and mushrooms, which had a surprising amount of mushrooms, but the sauce was tasty and it satisfied me after all. Feeling much better after the meal, it was back to the hotel room to enjoy our tasty pastry treats and watch an episode of Top Gear. I didn’t want to deal with the ride report, and figured we’d have plenty of time to do it tomorrow as it would be a short ride to Ushuaia and we’d have all day left to explore and catch up on ride report and internet stuff.